The plight of the beauty lover: there’s never enough storage, there’s never enough light and your towels never hide all your fake tan or foundation that you were SURE you got off. Functionality is important for any beauty lover’s bathroom, as well as creating a relaxing, inviting environment for those long baths where you can finally enjoy all of those indulgent bath bombs and bath oils you accumulated. Now, speaking of long baths, I’ve been thinking about what the dream bathroom would look like for any beauty obsessive like myself if space was abundant and budget was aplenty. I’d start with a freestanding bath, as they are super aesthetically pleasing for all those dreamy Instagram pics. Investing in a bath rack would also be a pretty great idea so you can take all the important things in there with you, like your phone, books, beauty products…wine. As pretty as it may look, keeping your makeup out in the bathroom could cause unwanted damage, and as we all know, the most sought-after foundations are rarely cheap, so this is something worth avoiding. Your makeup sponges and brushes are at risk of mould and bacteria if kept out in a damp warm room so should also be stored in a cupboard. The same goes for your fake tan, keep it stored in a cool dry place or it’s at risk of going green! Proper storage of your makeup and beauty products can make them last longer and save you some money, so I’d definitely invest in some aesthetically pleasing storage for my vanity bathroom. The thought of sourcing everything and making sure it not only all matches, but fits into your space is pretty daunting, but there are places where you can get everything in one go. When I was researching for my dream bathroom, I came across the huge range of Bathroom Suites from Better Bathrooms, which would be a great place to start. There’s so much inspiration in terms of how to design the layout of your dream bathroom, it’s hard to pick a favourite! Some products are so beautifully packaged that I know I for one don’t like to hide them away yet leaving them out can often look more cluttered than chic. Investing in some shelves to display those products that are too gorgeous to hide would work well, not only will this save some space, but attention will also be drawn in their direction, making them a focal point of the room. Another feature I’d definitely look to include at the top of my wishlist, is an illuminated mirror. Light up mirrors are a must-have piece of beauty tech as they enhance any flaws and leave no room for mistakes. They’re also pretty multifunctional, in that they can also act as a creator of ambient lighting for a relaxing bath, enjoy bathing in the glow. Practicality wise, most illuminated mirrors are LED-based, meaning they’re cost-effective and pretty energy efficient too, plus they just look so pretty it’s unreal! How many white or lightly coloured towels have you been through that are now that weird pink-ish, tan-ish colour? And no matter how many times you wash them you still have these gross marble effect “ghost of tanning past” pieces of cloth? If I had a dedicated beauty bathroom, I’d definitely look into getting some darker towels. 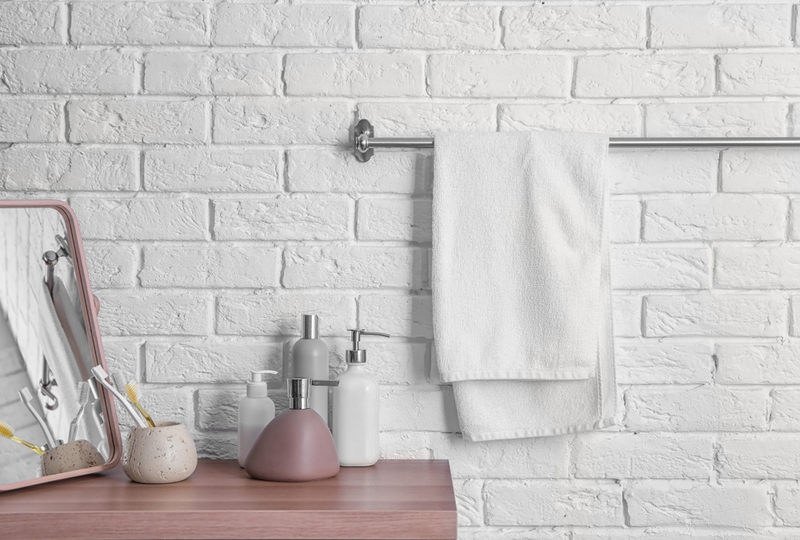 Not only can you make a bold statement in your bathroom by hanging out darker or bolder towels, but they’re also perfect for hiding any makeup mishaps. In the plight of my dream beauty bathroom, my plans have become more and more elaborate, and pretty costly at that! Maybe I could postpone that next holiday for a while…although I’m not sure that will go down too well with my husband! I've recently expanded my collection of beauty products, and yes, storage is a huge problem! There's only so much room on the back of the toilet, lol! I keep all my makeup and things in a drawer in my bedroom as my bathroom is so small, but end up spending far too much time running between one and the other when trying to get ready to go out! Wow that picture is beautiful! I love the idea of having a bathroom like that!